Power outages can happen at any time without prior notice and it happens in many places around the world. This does not happen very often, but for some reason, this phenomenon still poses a great threat to any household as it can cause damage to many household appliances. Now, what can you do in order to safeguard your household appliances from sudden power outages? Well, learning what an uninterrupted power supply (UPS) is will help you discover the solution to the question above. This device could provide a few minutes of energy, enough to safely turn off all your household appliances. But what if you need an extended, uninterrupted flow of energy? If this would be the case, then you’ll probably need something more than a UPS. Something more powerful, bigger in size and that has enough power to supply homes or work places with electricity until regular power services resume. If you’re guessing a generator, then you’ve guessed it right. Generators come in different types and sizes. Regardless of what features they have, they all work the same. Generators use up fuel in order to turn the head. This head consists of electromagnetic components that turn this energy into consumable electricity. Here’s the catch, the amount of power generated mostly depends on the strength of the magnetic field and the cycle speed of the generator. What Kind of Generator Are You Looking For (Home Use, RV, etc)? If you’re planning to install a generator, you need to determine first the size of the structure where you’ll need a backup power supply. Keep in mind that a home generator is different from those used at work and in the RV. This will help you decide what size generator you will setup. For home use, what are your options? Well, there are four. The first one is a portable generator, which is very common among homes. Though it is small in size, this generator mainly runs on gasoline, diesel or propane. The second type is the emergency generator. Generating five to eight kilowatts, this type is made to last longer than a portable backup power supply and can power more appliances. This is often used in bigger homes or in small businesses. But if you need heavy-duty backup electricity, then a standby generator is what you’ll need. This equipment is ideal in remote places where frequent power blackouts occur as well as in many establishments that greatly require uninterrupted power. Now, what about for those who prefer not to use fuel? The best alternative for them is a solar generator. This type only consists of three parts, the solar panel, a battery and a power inverter. Though it supplies backup electricity while the sun is present, it doesn’t work as much during rainy seasons, winter and at night time. If you want to know what is the secret to gathering more energy, here it is: the bigger the size of the solar panel, the more effective it is to take in solar energy. The type of RV where the generator will be installed. This may be a travel trailer, a pop-up trailer, a Fifth Wheel, a class C motor home, a truck camper, or a class A motor home. No matter what type or what size your RV is they can all be equipped with a backup RV generator. The type of fuel the generator will run on. Depending on the RV size itself, the different fuel types will help determine which generator an RV owner should buy. This could be diesel, gasoline, or liquid propane. Total wattage required. Let’s put it this way. The bigger your RV is, the more and bigger appliances it can accommodate. The more appliances you have, the more power it requires. Therefore, you need a generator that could supply ample amount of power. The number of appliances that need to be powered, as well as their wattage are also factors you need to consider before you decide what size of generator to buy. This is very important because if you run more appliances than what the generator can handle, you can’t tell what damage it can do to the generator as well as to some of the appliances connected to it. Appliances have two wattages, the starting watts and the running watts. Understanding what these two types of watts will be essential. Starting watts. This refers to the amount of power used after the appliance has been turned on. This is usually greater than the running wattage. Running watts. This refers to the amount of power used while they are running. If you’re planning to have a generator, what you need to identify first is the type and size of the structure where you want it to be installed. The size of the generator depends on the structure it will provide power. You may have to use a backup power system that’s bigger in size if the structure is bigger than expected. As we already mentioned before, there are 4 main types of generators you can choose from and, depending on your needs, one of those types will be best for you. Pay attention to the following tips in order to pick the right generator based on the size of available space within your home or office. If you happen to have a small space available then getting one of the popular portable generators makes sense. They are small in size and can provide a decent amount of power. If you happen to have a bit more room then you can choose between an emergency or standby generator. They are bigger in size and they can power both homes and businesses. They can accommodate heavier loads and provide power for a longer period of time than portable generators. Your last option will be solar generators and they are available in both small and bigger sizes. The only downfall is that they are quite limited since they depend greatly on sunlight and without it they simply do not work up to their full potential. Where to Buy a Generator? 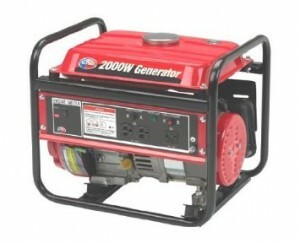 Generators can be purchased mostly from hardware stores. However, if you have any doubts or planning your emergency power supply system alone is already way over your head then you can ask a qualified electrician to help you out. They can tell you what size of generator you should use by assessing the electrical appliances used in your household. Buying a generator without further knowledge about what their capacities are could lead to an immeasurable disaster. So it is better to leave the hard part of the job to the pros if you need a decent electrical job done. Do your due diligence but make sure you take advantage of the knowledge of those with experience.